PERfACT: Painting Urbanism: What has Tirana learned? | Ngjyrosja Urbane: Cfare ka mesuar Tirana? Painting Urbanism: What has Tirana learned? | Ngjyrosja Urbane: Cfare ka mesuar Tirana? Storefront for Art and Architecture presents the work of Dutch artists Haas & Hahn in the exhibition "Painting Urbanism: Learning from Rio". The exhibition is composed of paintings, documentary footage, pictures, sketches and plans of past, present and future projects from Haas & Hahn. Present projects include proposals for two New York interventions and future projects span throughout the word. I put this event in here because it made me think of how this initiative has changed Tirana. It was and has remained a controversial projects for a long time, and maybe now it would be a good time to go back and revisit it. Was it productive? Did it change/influence? As we all know, the city of Tirana has already 'learned from Rio' (in a sense) and intervened using color and imagination to activate its urban space and transform the energy of the metropolis. -But, is it only operating on a surface of the constructed city? 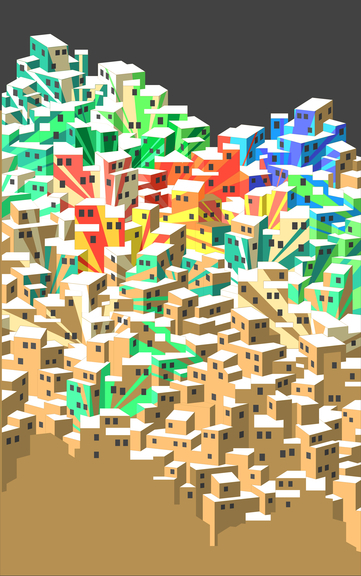 -Is it performing as a catalyst to initiate and later explode/reconfigure spatial/social dynamics in the city? -Does it work on a city level, or would it be better practiced on street/storfront level? -Does it work better than preservation or renovation of the existing city fabric? -Does it perform better as a catalyst (temporary) or as a more permanent solution? These are questions that have been circulating around since the Painting Urbanism Project started in Tirana a few years back. They're still relevant now, because after all this time we can actually answer a few of them and we may be able to draw conclusion on what works and what doesn't, and how to maximize its results. It would be interesting to compare the colorful painted urbanism intervention in Tirana, with the Rio slums, and New York City proposals. Vitrina per Art dhe Arkitekture paraqet punen e artistave Haas & Hahn ne ekspoziten “Ngjyrosja Urbane: Duke mesuar nga Rio.” Ekspozita eshte e perbere nga piktura, filma documentare, foto, skica dhe plane te projekteve nga kjo duo hollandeze. Ato perfshijne propozime per dy nderhyrje ne New York, si dhe projekte te ardhshme urbane. E ve kete event ketu, sepse me beri te mendoj se si kjo iniciative ka ndryshuar Tiranen. Ka qene dhe mbetet akoma nje projekt kontroversial, dhe ndoshta tani do te ishte koha e pershtatshme per t’iu rikthyer. A ka qene produktiv? Ka ndryshuar gje / ka qene nje faktor ndikues per qytetin? Sic e dime te gjithe, Tirana tashme ka ‘mesuar nga Rio’ (pak a shume) duke nderhyre me ngjyra dhe imagjinate per te aktivizuar hapesiren urbane duke transformuar energjine se metropolit. -Por, a po vepron ky projekt vetem ne siperfaqe? -A po perform si nje katalizator qe te nisi dhe me vone te shpertheje/rikonfiguroje dinamiken urbane dhe ate shoqerore? -Eshte me mire te behet ne nivelin e qytetit apo po te perdoret ne siperfaqe me te vogla si vitrinat ose qepenat? -A funksionon me mire se ruajtja ose rinovimi i struktures ekzistuese urbane? -Do jete me produktiv te perdoret si nje katalizator ( i perkohshem) apo te jete nje zgjidhje me permanente? Keto pyetje jane bere qe ne fillim te ketij projekti disa vjet me pare ne Tirane, dhe jane akoma relevante. Pas gjithe kesaj kohe, ne mund te jemi ne gjendje ti pergjigjemi disa prej tyre, dhe te nxjerrim perfundime se cfare punon dhe cfare jo, dhe se si mund ti shtojme rezultatet qe duam. Do te jete interesante te krahasonim nderhyrjen me ngjyra ne Tirane, me lagjet e varfra ne Rio, dhe propozimet e bera ne New York. 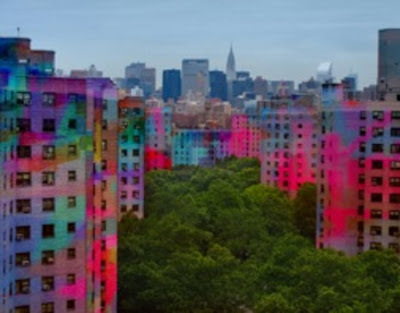 Painting Urbanism resides in the intersection between land art, supergraphics, graffiti and urban planning. It takes the built environment as a continuous territory beyond notions of public and private; it activates the urban fabric introducing new spaces of intensity and collectivity beyond spatial conditions and denounces the underutilization of residual spaces of design and action within the city. There has always been within the world of art, anthropology or artistic practice a fascination with the structures of society that exists in the margins of legality, at the edge of the possible. 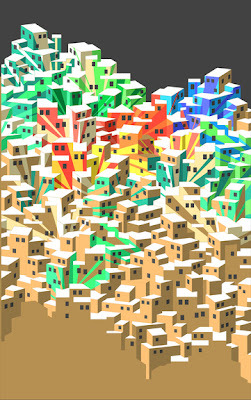 During the last thirty years, exacerbated by a massive rural exodus and a radical and spontaneous growth of cities throughout the world, slums, places constructed and inhabited outside the normative and canonical spaces of the city, have been at the center stage of the territories of the marginal. This fascination has incited a large group of architects and artists to immerse themselves within slums as ethnographers, surveyors or involuntary colonizing figures of normalcy. These excursions into the new frontiers of society have resulted in a proliferation of studies on fragmented geometries, new beats and sounds or data visualization, all in the quest to capture, formalize or freeze that what originally captivated by its informality. This fascination though, has operated sometimes within but often beyond the socio-economical conditions of the slums. When trying to address them, projects have worked oftentimes as contemporary ambassadors of western standards of life: of public and private, of postmen and phones, of roads and squares, of infrastructure and culture, all with little understanding or respect for the inherent virtues and lessons to be learned from these communities. In 2005, Haas&Hahn landed as a pair of ethnographers to shoot a documentary film on Hip Hop culture in the favelas of Rio de Janeiro. As a product of the multiple informal conversations with the inhabitants, they sensed an opportunity for action beyond documentation and started their first painting project in the favelas with a mural of 150m2 "Boy with Kite" in Vila Cruzeiro. The project, materialized jointly with the inhabitants of the favela, produced an immediate effect in the community and their collective image within the larger metropolitan area. Two subsequent projects in different favelas, Rio Cruzeiro (2000m2 in Vila Cruzeiro, 2008) and Praça Cantão (7000m2 in Santa Marta, 2010) unveiled a methodology of action within the built environment without precedents: Painting Urbanism. Haas&Hahn have been able to generate a body of work that grows from the formal intricacies, legal conditions and social dynamics inherent to slums and produce a method of action that would hardly be able to be envisioned within the normative spaces of western models of urbanization. Learning from Rio: While currently, the majority of cities and governments worldwide are more concerned and focused on preservation and restoration than change and action, Painting Urbanism opens up the possibility of large interventions within the city that bring together the large questions set forth by the big visionary proposals of architects and urban planners of the twentieth century. Painting Urbanism is able to act within the present urban reality by intervening on the liminal surface of the constructed city and produce spaces of true collective aspiration just through color, form and imagination. This exhibition showcases the work produced by Haas&Hahn during the last six years and a series of proposals for two New York interventions and future projects throughout the world from the suburbs in Paris to the city of Cairo. We invite you to come, learn from Rio and act. Eva Franch i Gilabert, Director. Haas&Hahn is the working title of artistic duo Jeroen Koolhaas and Dre Urhahn. They started working together in 2005. Dre Urhahn (Amsterdam, 1973) has worked as a journalist, copywriter, and art-director and has set up successful companies specializing in different fields, from event management to television production. Painting Urbanism is not really urbanism or architecture. It is an art installation at the scale of the city. It is decorative art, a very thin layer of ornament applied to architecture. This is what has been done to architecture, not really architecture. It is not spatial, it is not material, it is not tectonic, and it does not produce anything else rather than a visual effect. It is just paint! I hope it is just a temporary cover-up of the city, and that new architects in Tirana will not mistake it for anything more. I disagree that painting all the grey old residential buildings in Tirana is not architecture. No reason to tip-toe around the issue of whether it was architecture or acting upon a piece of pre-existing architecture. It certainly had a big impact in the spatial development of the city. Most importantly thought it had a direct positive impact on the people living in Tirana in the 2000s. It reset the city. It gave people reference objects in the polluted chaos that existed at the time. It was definitely not just ornament, on the contrary it was the act with the biggest architectural and urban impact on the city since the Italian-built main boulevard. An instinctive yet highly successful "broken-window theory" intervention. In my opinion it was also the only practical solution to a city that had lost its identity. And it's a pity that the colors are fading - no one is going to replace the ugly concrete residential blocks of Tirana anytime soon. I strongly believe that conceptually Albanian new architects should hold this intervention close to their inspiration board when designing. See, here, it's not about what you can design, it's about what you can actually build. When you say: "It is decorative art, a very thin layer of ornament applied to architecture." - you are regarding the cracked plaster facades of sprawling urban development architecture, and yet shunning the best thing to happen to the city in 2 decades.